I was at the butcher the other day asking for something inspiring. The lovely Aaron just looked at me, muttered something about indecisive cougars and told me to just pick something. After a tongue lashing from me and stating a few facts (being number one that I am NOT yet in my forties so out of cougar range and secondly happily married so strike two buddy boy!). Aaron is a lovable 20 something lad with a devilish twinkle in his eye; a tongue lashing from a regular is just what he needs, mind you I have got to find a way to stop him calling me mum in front of other customers...he's ageing me terribly with the locals! I walked away that day with a lovely piece of pork neck so I forgave Aaron and promised to make something delicious that he may taste if he stops calling me mum! Pork neck isn't really a popular piece of meat; maybe it is the name that puts people off or the fact that it isn't a common cut used in recipes. It is a pity because it is a beautiful, flavoursome cut perfect for pulled pork or cut into steaks and BBQed! The piece I had was frozen, reserved for mincing which is the norm. Of course I really wanted to do BBQ pulled pork, however, when the day finally came for me to start cooking I was short of hickory chips for the BBQ and time- I am always short on time! With this thought in mind I decided to dust off my slow cooker once more and put it to use. This recipe was made up with two different ideas in my head. I was still wanting to BBQ the slab of meat because I wanted that lovely smoky flavour but I also had a lot of fennel seeds in my pantry and love the combination of pork and fennel. Finally I decided to combine ideas I picked up from other bloggers and see how that turned out. Most rubs I looked at had brown sugar in them which is totally fine but the problem I had was I knew I wanted to sear off the piece of pork before adding it to the slow cooker and if I rubbed in the brown sugar it would of burnt before I could get a nice colouring on the meat. In the recipe you will see I added the sugar at the end as this dish really needs the depth of sweetness to really pull it together. Slow cookers are perfect for slabs of meat (I have never been a fan of cooking smaller cuts in the slow cooker as I find it overcooks the meat and it has a funny after taste to it). Arriving home after a big day out to a fantastic smell of braising meat is pure heaven! 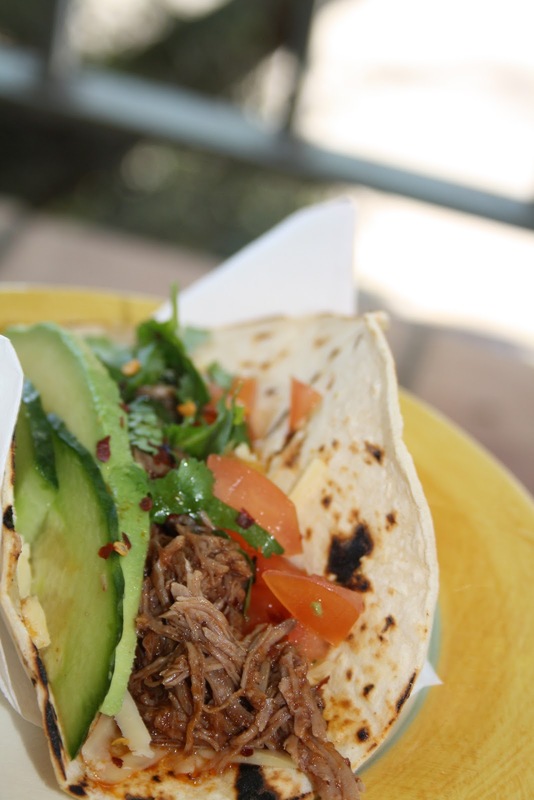 What's even better is pulling the pork apart while still warm then reducing the sauce slightly (with added sugar) before pouring the juices all over the meat and having heavenly soft tacos for lunch the following day. Especially since we spent the morning at the footy field watching Max's team play a great game of football on a sunny winter's morning here in Sydney. OK so I didn't quite manage to make the BBQ version, however, if you're after a delicious braised pork dish and don't have hours to hang about the house- pull out the slow cooker! For the dry rub: place whole peppercorns and fennel seeds into a mortar and pound into a powder or pop in a spice grinder to blend. Add remaining spices together then pour on to your piece of meat and rub it into the flesh and fatty bits until evenly coated. Leave outside on the kitchen bench for 1 hour. Turn on your slow cooker to HIGH and add bay leaves, wine, tomatoes, stock and garlic and leave to warm. Heat up a frying pan to sear the pork neck. Sprinkle with 2 tablespoons of salt and rub in 2 tablespoons of rice bran oil then sear until all sides are nicely browned. Place pork neck into your slow cooker, pop the lid on and leave for 5 hours. After you've gone out for a lovely day, come home lift off the lid, gently pull out the piece of pork neck and it should look like the picture below. While it is still hot, get two forks and begin pulling the meat apart. While you are doing this, add the brown sugar to your sauce and put in on a medium heat to simmer for about 5 minutes or until it slightly thickens. 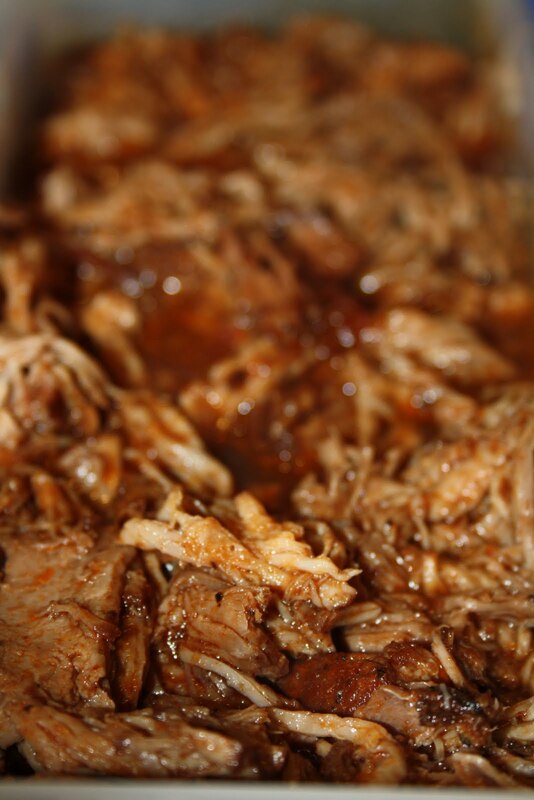 Strain the juices over your pulled pork while it is still hot and cool the meat in the sauce for best results. Great writing and great looking taco! That's great Sarah, I'm sure you won't be disappointed! I must try the food trucks around Sydney myself! Sorry Camilla!! I missed the bit where I realise you are a local! The Agape Organic truck also has the most delicious pizza and the spelt brownies are to die for. You can follow them on Twitter! Lol, no worries but totally need to get myself there so thanks for the push! I cooked a 2kg pork neck for 5 hours on low after browning in my slow cooker first. The pork shredded so easily and tasted amazing. We served in wraps with cucumber and rocket. Very yummy - leftovers in rolls for school lunches for the next 2 days! Excellent. I wanted to give pulled pork another try but when I got to the market this morning, or afternoon I should say, since it was past 12 by the time I got moving, they had no pork shoulder left (that's what I used last time and what seems to be in so many recipes). I asked what else would be suitable for long, slow cooking and she suggested the lovely hunk of meat I'd been eyeing up, which turned out to be neck. And when I googled to see if that's suitable to use for pulled pork, your post was the first thing that came up. You even had the same amount of meat as I bought. Well, I got nearly 1.2kg - planned on just 1 but I got it with bone it so took a bit more of it to compensate. Wishing now that I was cooking it today already and not tomorrow.